See animations demonstrate the use, customer videos with various types of equipment and all product catalog in PDFformat. 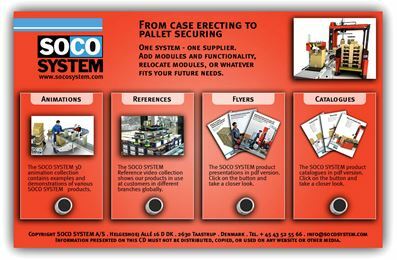 Get quick overview of the wide range of standard case erectors, case sealers, roller conveyors, pallet magazines, pallet conveyors, palletizing robots, pallet wrappers and more. All modules are part of the same system - easy to extend, easy to change and easy to move.